Thursday was picture day. The kids arrived in their beautiful dresses, tiny bow ties and an air of excitement. Spring pictures are always fun as they get to pose together as a class and then take the individual pictures. I passed out the individual cards for the photographer and then waited as the kids went up one by one. I heard these words coming from a little guy standing next to me, holding his card. Huh? I looked closely at the card he was holding and realized he was reading the words on the card! There was a checklist that listed, “principal, teacher, student”. He was reading the checklist and making meaning from it. The words “please give this card to the photographer” were printed at the top of the card. But here’s the thing. This little guy has been struggling learning to write his name. He’s been struggling with getting 1:1 solid. He’s been reluctant to read with me in his guided reading group or in conferences. He recently tested at a level 2 on the DRA assessment. After our pictures, we went back to the classroom and started readers workshop. I asked my friend to come over and read with me. I pulled out a book about a giant gingerbread man who actually chases after the old man and woman who made him. I invited him to read it with me, telling him it was a crazy twist on the other gingerbread man stories we had read. He devoured it, reading fluently, laughing and making predictions, connecting it to the other stories we had read. It was clearly an easy text for him. It was a level 10 book. He wanted more books, so I let him pick some more to put in his book box and sent that happy, excited reader off to enjoy his reading. He was absolutely glowing. That 10 minute conference left me with much to think about. Was I holding him back as a reader? Did I have him locked into a level instead of constantly looking for what he was doing well? Was he bored with the level 2 and 3 texts? Did he not see any value in this reading thing? Did he not see himself as a reader? Was he reluctant because he preferred building in the block area instead of reading with his guided reading group during Explore? Were my expectations too low? Was I not looking at him closely as a reader? Did I not really know him as a reader? It gave me much to reflect on, and a renewed commitment to knowing each and every reader in my classroom at an even deeper level than I already do. 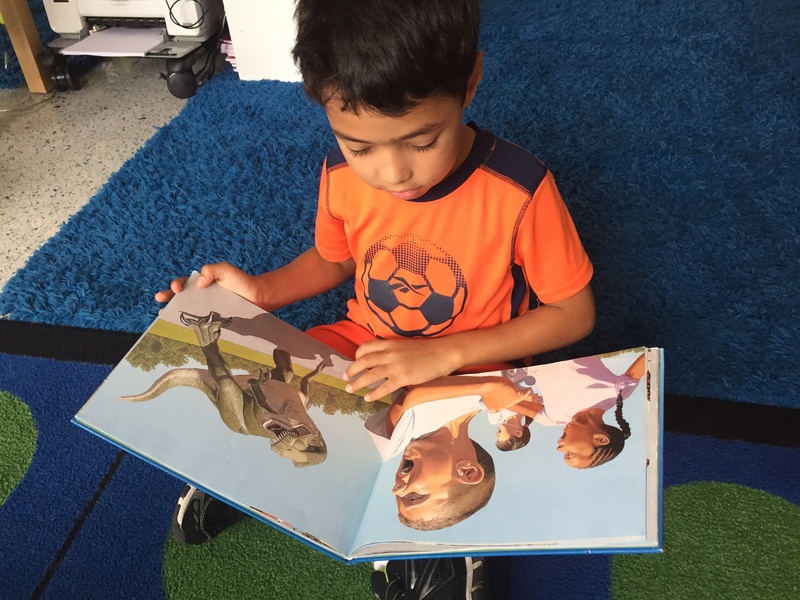 Thank you, reader friend, for letting me hear you read that picture card and for reminding me of the importance of looking closely, listening carefully and celebrating the magnificent work our young readers do. Do your students know their reading level? Why? Why not? Lately I’ve been thinking a lot about leveled texts and their purpose and place in the classroom. Thanks to Irene Fountas and Gay Su Pinnell for designing a text gradient based on Reading Recovery levels, teachers have strong support and guidance when they are matching books to readers. But the level of text is only one thing we can use as a resource when making decisions. We also need to know about the child’s interests, strengths and weaknesses, what strategic actions they are using, how they are constructing a reading processing system, etc… But I am concerned how these levels are being used in classrooms across the country. Fountas and Pinnell intended for levels to be used by teachers, as a way to help teachers analyze texts and select “just-right” books for small-group reading instruction and as a support for teachers to guide readers in choosing books. They never intended levels to be used by students. The levels on books are for teachers, not students. -Fountas and Pinnell, Teaching for Comprehending and Fluency, page 152. I started thinking about teaching independence and how that connects to this quote. 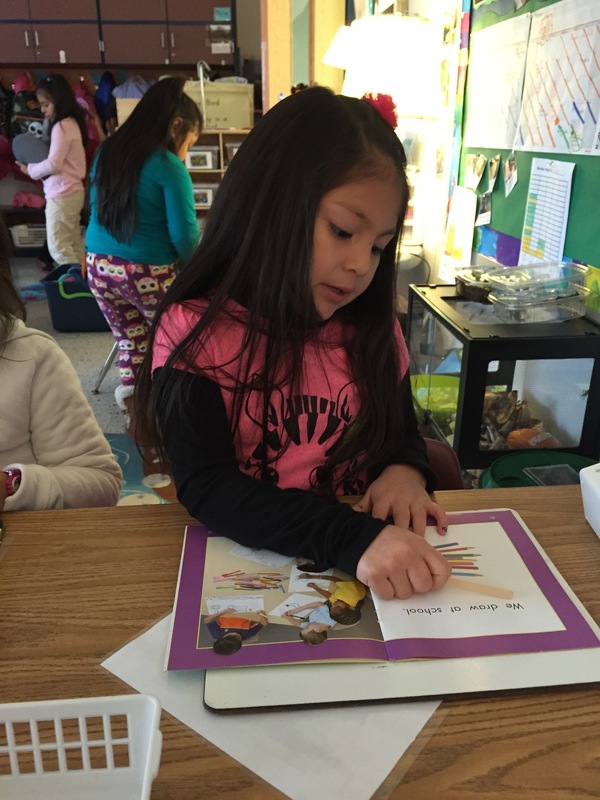 If our goal is to teach children to be independent, self-motivated, voracious readers – then aren’t we doing them a disservice by labeling books in our classroom with levels? This is going to encourage mindlessly choosing a book because “it’s a J” – not looking and thinking if it’s a good match. I think teachers have to teach children how to choose just-right books for themselves, not teach children to rely on a leveling system. I’m very concerned about the authenticity of teaching children to use the level of a book as a guiding factor. What happens when that child goes to the book fair, the public library, the bookstore or to a pile of books at a yard sale? Real readers in the real world don’t use a level to choose their books. If children have access to lots of books that are “just right” from guided reading and conferences – carefully selected by teachers for that student – and teachers are teaching kids what makes a “just right” book, then shouldn’t we be giving them the opportunity to practice this when choosing books from the classroom library, the public library, a bookstore or when out with their families? We want to create real world readers who can assess whether a book will be a good choice independently. What happens when children are told their level? Often times that becomes the way a child defines himself as a reader – bragging “I’m a level M.” or, with head hung low, “I’m only a level E.” How do you define yourself as a reader? What would your answer be if someone asked you, “what kind of reader are you?” I would guess that no adult is going to identify herself as a level. I want my kids to say things like, “I’m a reader who loves Mo Willems, who likes to read books that are about real things and who can’t wait to see what new books arrived at the library.” Perhaps asking your students this question might give you some insight into what kind of readers they are becoming. Do we want kids who can identify what kind of reader they are or who can tell us what level they are? Another thing that I’ve seen is a high level of competition and comparing in classrooms where children know their levels. Instead of clamoring to read the new Mo Willems book, or an enticing picture book displayed at the library, children quickly dismiss books if they are not on their level and start to look down on children who are at a lower level. At the other end, I’ve seen strong readers held back by their level – being made to stay at a level when they can really take on much more challenging and interesting texts because they’ve been identified at a level lower than where they are really reading. That level becomes part of the readers’ identity. Kids are ashamed to be reading at a level that is not associated with that grade level. The focus becomes all about a level instead of about reading, books, authors, genres, series books, or fabulous illustrations. When I sit down to confer with a child I never want the focus to be on what level we are aiming for. Do I have that in my head as a teacher? Of course. It’s a tool I use as a teacher. But I want children to be working on their reading and setting goals relating to thinking deeply about texts, authors, genres, a variety of topics, talking about reading with others, enjoying reading and creating a reading processing system that helps them in becoming fluent, flexible, strong readers. I don’t want their goal to be moving to the next level. What happens when parents are told the level that their child is reading? Most parents have no idea what a “level J” book means. I’m concerned that this is making school reading and real world reading two different things. It’s creating a gap comparable to when we teach young children to use words like “schema” and “metacognition” – parents are mystified as to how reading instruction is happening. Parents may start to compare their child with others in the neighborhood, or try to push reading books at a much higher level than that child can handle at the moment. What if, instead of sharing a child’s reading level at conferences, teachers showed families examples of books where that child is reading now, and examples of benchmark texts for where we are heading? This helps families understand what their child is working on and helps them understand much more than a “level J” text. So do my students know their reading level? No. These are a few reasons why. But are leveled books important? YES! Check back for Part II tomorrow when I will post on how I use leveled texts in my classroom as an important tool for teachers. I would love any thoughts on this post. I realize this may leave some people uncomfortable or unsure or questioning our practice. But isn’t that what we want to do as educators? I invite you to ask yourself, your team and your school “how are we using leveled texts, and why?” As Lucy Calkins wrote in my The Art of Teaching Writing book many years ago, “be brave enough to outgrow your own best teaching”. Questioning and challenging how levels are being used, and what messages we are sending, might be an area where we need to be brave. These wise words have stuck with me since 2003, when I first read them in Regie’s wonderful book, Reading Essentials. This year they came back to me loud and clear. I have a group of fabulous students. They are kind, loving, thoughtful, fun, curious, passionate, inquisitive and they need A LOT in the area of school literacy and academics. Our beginning of the year assessments made it very clear to me that intentional teaching, with a sense of urgency, was essential for this year to be a success. Urgency doesn’t mean that our classroom is a stressful, rigid place full of drill and skill activities. Do we have fun? YES! Do we play? Absolutely! (It’s how children learn!) Do I keep in mind that they are 5 and 6 years old and make sure that my practices are developmentally appropriate? Of course! Do I enjoy each day with my learners and do they enjoy being at school? For sure. Do I stay true to the belief that I teach children – not standards – every day? Indeed. Do I make sure my children have every opportunity to learn the necessary literacy skills to be successful? That’s my job. Teaching with a sense of urgency is happy, relaxed, purposeful teaching. It’s making every moment count. And that makes an impact on student learning. Here are a few structures I’ve put in place that are supporting my young learners and helping them make great progress in the area of literacy. 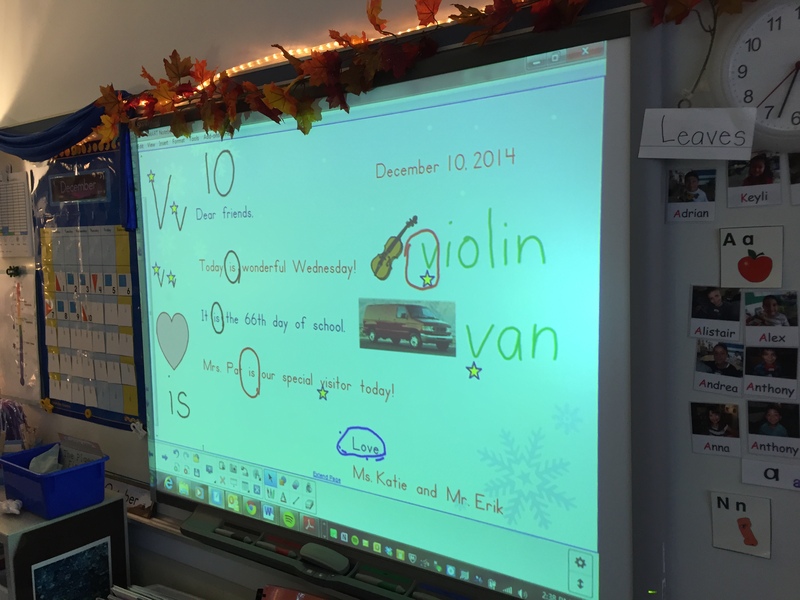 The morning message on the SMARTboard. -A stronger focus on letters, sounds and other “item-based” things in the context of meaningful literacy work. One example is our daily morning message. It’s a 10 minute, highly focused, literacy event that kids love. I highlight a letter and how to correctly form it, we find words that start with that letter and say the sound the letter makes, we find that letter in the message and we look for other letters and words we know. We talk about words vs. letters, capital vs. lowercase letters, spaces between words, what letters are first and last in a word, and punctuation – just to name a few things that come up during morning message. This is all done through a meaningful message – keeping in mind that meaning making comes first. This message goes home with the kids to share with their families. I print a copy before we do our work together and then another copy that shows the work we did – I copy it 2-sided and send it home. I plan my focus each day based on where my children are and what they need next in their learning. -Guided reading groups with all children 3-4 times each week. Our kindergarten team is reading and discussing Jan Richardson’s book, The Next Step in Guided Reading. 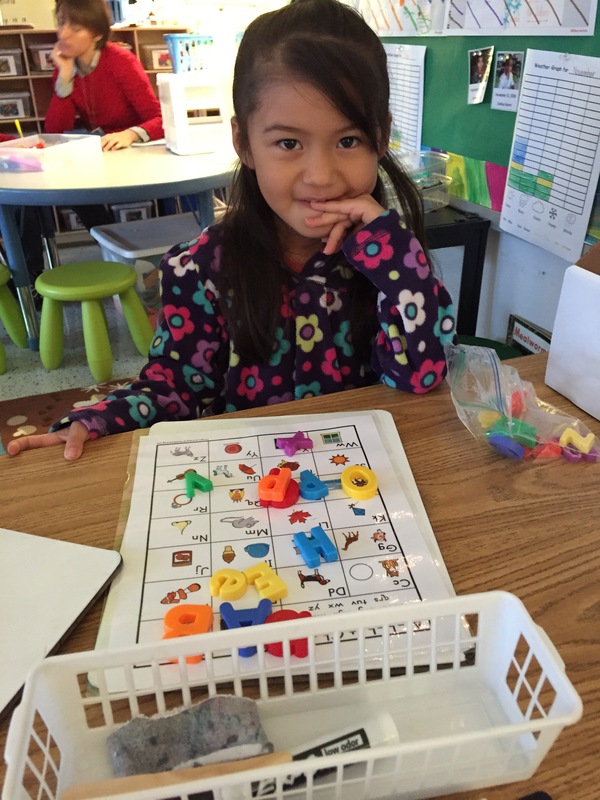 We looked carefully at the pre A – emergent lesson plans and structured our lessons around her framework. When I meet with my pre-A emergent groups (currently, 14 of the 18 children in my class – students who know fewer than 40 upper and lower case letters and hear few, if any, sounds and are lacking in early concepts of print), we go through a fast-paced, engaging lesson that includes working with names, working with letters, letter formation, working with sounds, a shared reading lesson where each child has a copy of the book and an interactive writing lesson. I have a record of where each child is in their letter, sound and link acquisition and can teach directly to their needs within the small group lesson. I love that these groups have the necessary item-based components AND the meaningful reading and writing piece that is so important. I reflect and assess often, changing the groups and the activities within the groups to make sure that they are matching the needs of my learners. Our letter tracing books – known letters are marked with small Post-it notes. -Daily letter tracing books with my instructional assistant. Jan Richardson talks about tracing alphabet books in her book. I made paper ABC books with upper and lowercase letters and a picture and started by tagging the letters in their name with a Post-it. The students take their finger and trace the letters using the correct formation path, then say the link. 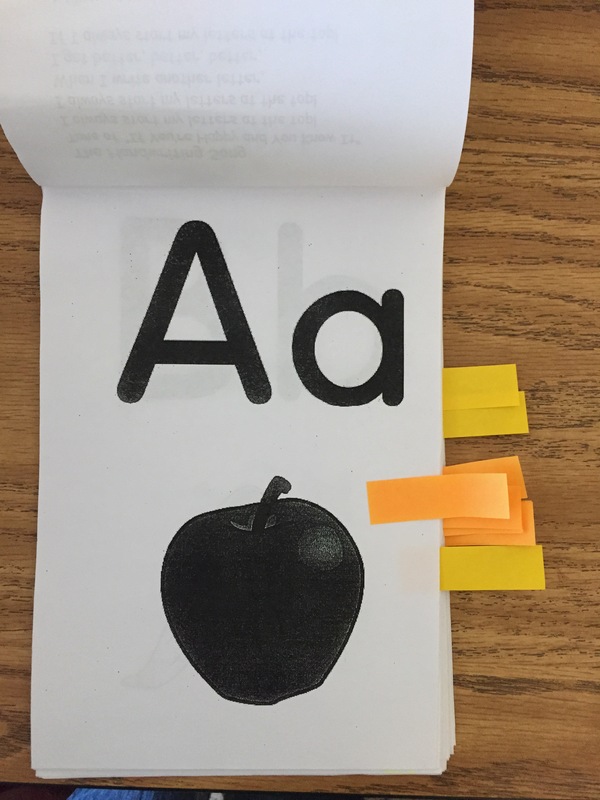 (A a apple) As they learn the letters, we add new letters for them to learn – tagging those letters with Post-it notes. 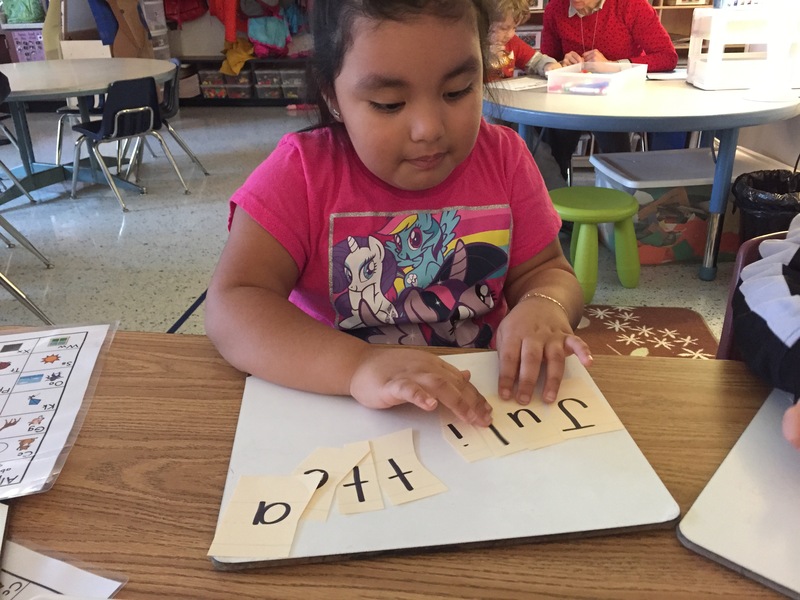 Each day, our students have a 3-5 minute session with an instructional assistant or a volunteer, tracing and saying the letter names and links that are tagged. Eventually, they will have all 26 pages tagged with Post-it notes and will be able to trace, say and identify the link for all the letters. We have seen remarkable results in letter identification through daily use of the letter tracing books. These are just a few of the ways I’m teaching with urgency this year. This is all in addition to many read-alouds throughout the day, rich discussions and purposeful talk in the classroom, a daily writer’s workshop, shared reading, community writing, inquiry based projects, listening to and responding to interests and wonderings that the children have, and building a strong community of learners.